My third giveaway to celebrate National Vegetarian Week is a delivery of £75 worth of veggie meals from Amy's Kitchen. As if that isn't enough you will also receive a hessian bag and ceramic bowls. Amy's Kitchen is a family business… with every member of the family taking part. The company was started in 1987, when Amy was born. Her mom and dad, Rachel and Andy Berliner, carefully nurtured the company as well as the child. Amy's Kitchen specialise in healthy and delicious vegetarian, vegan and gluten free meals. You can find them on the aisles and in the freezers at your local supermarket. Would you like to win this tasty delivery? Just leave me a comment and use the rafflecopter to enter the giveaway. The giveaway will run until 14 June 2015 and is open to my UK readers. Good Luck and Happy Vegetarian Week! I often buy Amy's kitchen meals and they are very tasty! Thank you for another great giveaway! OOOh, this is such a great giveaway! Eeeep! I used to buy Amy's tinned stews when I was living in SW london. I haven't had them since I moved away from the shop - would be lovely to rediscover them. Fab Giveaway! Happy Vegetarian Week! I haven't heard of Amy's Kitchen before!! What a super giveaway! I love Amy's kitchen meals! never tried these but they look scrummy, perfect after getting from a long shift at work! great prize - the meals look great! 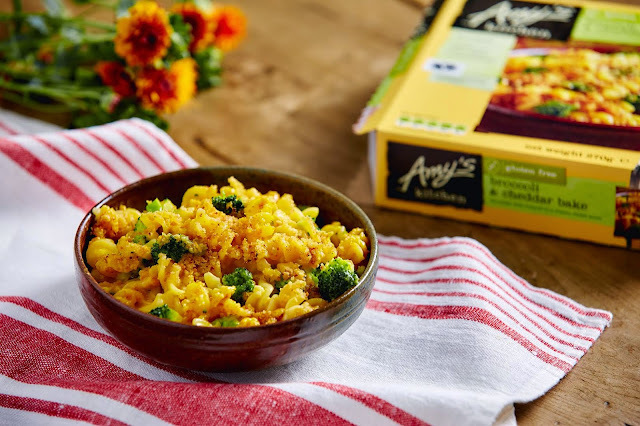 I've never tried Amy's Kitchen meals, so this would be a great chance to give them a go. I have never tried Amy's Kitchen meals. Fab prize! I used to be a vegetarian and then ate meat again and have recently returned to be a vegetarian so I shall have to try these! With various allergies in the family it's wonderful to have Amy's Kitchen producing so many delicious meals. I'm always on the lookout for healthy veggie products that are delicious and easy to make for those days when you're just too busy to really put the time into cooking something, and these products look perfect! Also gotta love that it's a family run business definitely be keeping an eye out for these next time i'm at the supermarket. I'd like to try the Broccoli & Cheddar Bake. Lovely giveaway. It would be great to try other products in the range. I've never tried any of these before! Wow what a great prize,I'd really love to try all these. I would love the chance to try these. Would be extremely useful, fingers crossed! love to try these out on my vegetarian family! You have to be my find of the month! I am looking forward to trying Amys Kitchen products. Fab giveaway too. This range looks super delicious. fabulous giveaway fingers crossed !!! 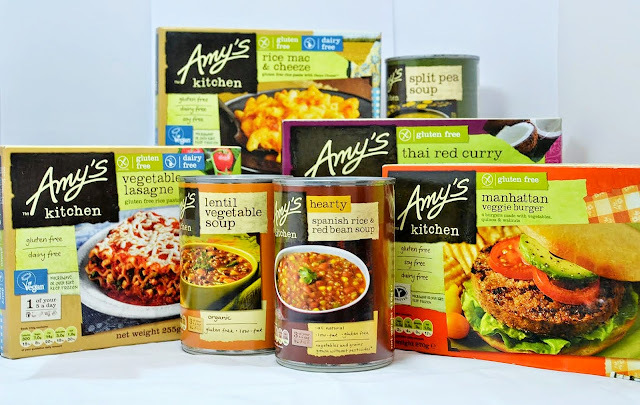 As a veggie I would love to try these Amy's meals selection. I cook from scratch a lot but always like to have the odd thing in for those lazy days!! I LOVE finding new vegetarian meals. I've also found a lot of new choices in local supermarkets :) My mum would love this aswell! I would really like to try the spanish rice and red bean soup. Although, I might add a little chorizo to it first. These look so tasty, I've heard some really good things about Amy's Kitchen - but I've never found tried them. wonderful! have not tried these, will deffo look out for them they look great! Lovely meals and healthy eating. These'd save me doing any cooking! Lovely prize! I love the Amys Kitchen burritos! I read about Jamie Oliver doing a veggie cookbook recently and it made me think that I would love to try more veggie based dishes rather than just meat with veg/pasta. Heard so much about the Amy's Kitchen brand - my mum loves it! LOVE Amy's Kitchen! Super giveaway. What a fab giveaway, ive never tried Amys kitchen before. Love your Macroni Cheese! Brilliant competition :-) All entered, thank you very much! I'm a horribly busy college student who lives alone, and with no one to do my cooking I literally LIVE off of Amy's meals! Plus, I'm gluten-dairy-egg/red meat-free, so Amy's and I are good buddies. Soulmates, even. Too bad she's so damn expensive! I would love to try Amy's Kitchen products. Always good to have Amy's soup at home, never know when you want it. I love Amy's Kitchen products! I always have a can of Amy's Kitchen lentil soup in my desk drawer for the times when I've forgotten my lunch. It's the perfect keep-you-going healthy snack! My son has just turned Veggie, been a month now. You've got such great giveaways, thanks! Being vegetarian, I buy lots of Amy's Kitchen goodies so I'd love to win this! Even though I'm a veggie, I've never tried this brand before, they look perfect for when I don't feel like cooking. Thanks for the yummy giveaway. Would love to give these a try. Howdy! Thanks for the giveaway. Lovely giveaway - would love to try this range. Thanks for having a such a fab giveaway! Thankyou for the giveaway. I love Amy's Kitchen meals especially her rice mac and cheese. Great prize, love amys kitchen. I've never tried anything from Amy's Kitchen but they sound absolutely delicious!! Ive tried the soups and they are lovely! This is an amazing giveaway would absolutely love to win! I'd love to win this prize I've tried a couple of the meals before the macaroni cheese is amazing! I've tried the mac and cheese before and I LOVED IT, Its a shame its so difficult to get in shops near me, would love to introduce my family to their products! I've never heard of Amy's Kitchen before but these look yummy! I haven't tried Amys Kitchen before but would really love too! I'd love the chance to try these products. Great giveaway - I've tried one of the Amy's Kitchen soups before and loved it! I love Amy's vegan food-great if I can't be bothered to cook. Oh Amy's Kitchen is gorgeous - what a fantastic prize! I love Amy's kitchen food, been a vegetarian for over 20 years and it's always nice to find new yummy things. A great way to encourage people to try veggie food. Wow this looks amazing, plenty to munch on there! Thank you for such a great giveaway. I've tried a couple of Amy's Kitchen products and love the lasagne.